CryptoTradeMining Review – Illicit Crypto Investment Hoax! Conniving scammers are becoming increasingly more clever and deceptive as cryptocurrencies become more accepted and sought after world-wide. Once such instance would be the CryptoTradeMining site, which is an online mining platform targeting newbie crypto investors with unfounded guarantees of obtaining rich returns within a short duration of time. Revolving their business ideology around the familiar get rich quick scheme while targeting the surging cryptocurrency domain is a formula for catastrophe, or as these scammers see it, opportunity. Procure the facts disclosed to you throughout this unbiased review and understand for yourself why CryptoTradeMining.com should be averted through any measures necessary. Do not invest your faith or hard-earned bitcoins into this misleading Ponzi scheme until you read this composition in its entirety! CryptoTradeMining.com portrays their operation as the “world’s leading bitcoin mining provider.” Operating as an online cloud mining facility, CryptoTradeMining allegedly supports an array of crypto hardware and utilizes secured Bitcoin mining data centers to mine Bitcoin for crypto investors who deposit through their platform. The incentives offered in return for investors who deposit through their platform would be a fixed weekly return which enables this operation to function as a deposit and forget about it type of investment scheme. CryptoTradingMining fails to render any information of value regarding their ownership details. The About Us page featured on their site discusses exceptionally vague operational details while leaving out the main points. 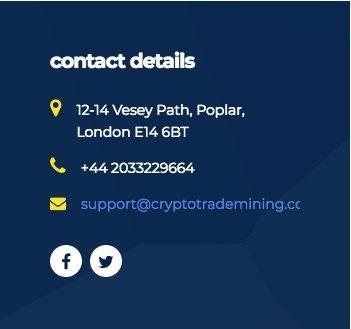 While the Contact Us page appeared to be a more promising provider of information, we narrowed down their alleged contact details of 12-14 Vesey Path, Poplar, London E14 6BT to a transportation corporation that specializes in executing custom order deliveries. Needless to say we found no correlation between the CourierNet site and CryptoTradeMining.com. This leaves only a few contact methods available which would be their feedback form, phone number of +44 20333229664 and email address [email protected]ning.com. While the About Us page claims that the site has been in operation since 2012, a WHOIS domain search will show us that the site was created on July 12th, 2017. Unfortunately, the creators behind this site privately registered their domain so we were unable to unravel any information regarding registrars behind this deceptive scam operation. 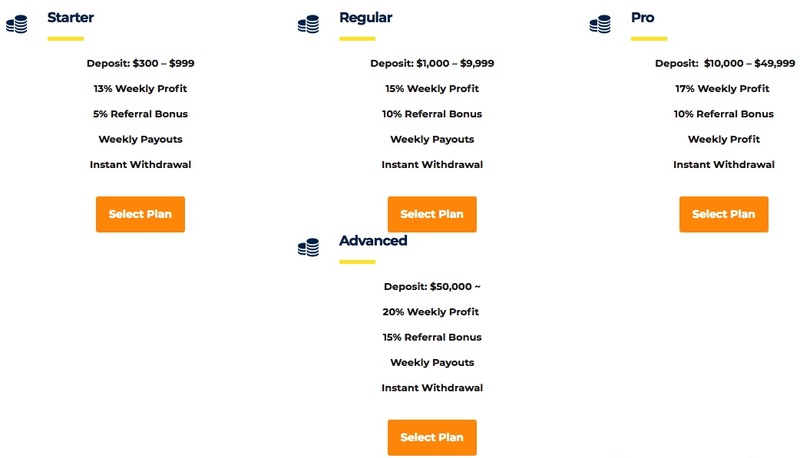 Each mining package comes with a lifetime membership that allegedly pays out weekly and provides instant withdrawals. Statistically speaking, an investor who enrolled with their starter package would be able to generate an approximate return of 576% annually without having to do any work what-so-ever besides depositing into their platform. Sounds a little too good to be true, don’t you think? Considering that most legitimate cloud mining operations generate returns near 25% to 30% on an annual basis, no where near 100% let alone 576%. CrypoTradeMining is a bottomless pit of falsehoods that generate countless red flags. Promising returns that are unrealistic and completely unsustainable while deliberately stealing other active corporations’ information in the attempt to further build their credibility and trustability is downright pathetic and reveals just how desperate these con-artists truly are. Fortunately for us, CryptoTradeMining.com is not a popular site and possessed a SimilarWeb global rank of 2,747,9993 with an Egypt rank of 632,572 as of January 21st, 2018. This report indicates to us that CryptoTradeMining is still a relatively unknown operation and fails to receive even a modest amount of traffic. We believe our unwavering review has made it abundantly clear that CryptoTradeMining cannot be trusted! Functioning as a full breed Ponzi scheme, CryptoTradeMining will continue to deceive innocent Bitcoin investors unless the cryptocurrency community unites and stands strong against this corrupt cloud mining scam. CryptoTradeMining is an unethical investment operation that targets investors who are new to the cryptocurrency industry. Our recommendation when it comes to encountering suspicious cryptocurrency investment opportunities like CryptoTradeMining would be to trust your gut and avoid their schemes if they aren’t absolutely transparent or promise realistic returns. To learn more about the opportunities available through Bitcoin mining, feel free to browse our Cryptocurrency Mining Guide. Review Verdict: CryptoTradeMining is a SCAM! Do you have any urgent feedback to share regarding CryptoTradeMining or other illicit investment operations? Please share your feedbacks, concerns and insight by leaving a comment below! Have you been searching for legitimate and transparent solutions to invest your cryptocurrencies with? Expand your crypto arsenal by learning about the best cryptocurrency investment opportunities by visiting our Cryptocurrency Investment Center. Kirkland & Felt Review - Confirmed Scam!